Google’s new goal is to provide internet users with the most relevant results and the best user experience. Fast loading websites increase user satisfaction and improve the overall quality of the internet. 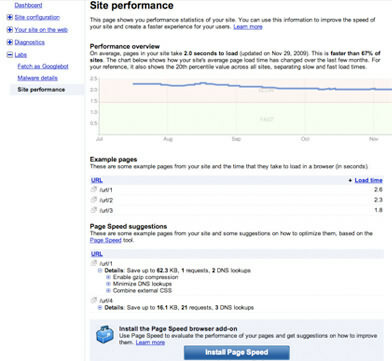 If webmasters improve their sites, the overall speed of the web will improve too. They recently started an initiative known as “Let’s make the web faster” and they released an experimental feature called “Site Performance.” You access this tool from the Google Webmaster Tools dashboard. During 2009, Google has been growing more and more focused on speed. Last month alone, there were two major developments and Matt Cutts indicated that Google might make page speed a ranking factor in 2010. Additional information and recommendations should become available over time, too. This tool should benefit just about everyone, considering that most sites visitors are impatient and sites do better when they stick around. After checking a site with this tool, it usually gives recommendations like reducing the amounts of DNS Lookups or using GZIP compression if it’s activated in your server. Also, if you want to send your feedback or opinions about the Site Performance feature, just be sure to let them know through the Webmaster Tools Forum.